Ever wondered about tile and grout cleaning, your kitchen or living room? What about the tiles on the floor? Yes you may indeed wash them every week (or pay someone to do it for you) but what is really going on with those tiles? Do you not suspect that maybe - despite your very best efforts - there could be a buildup of grout? Perhaps a thin, coarse mortar has slipped into the narrow cavities of your tiled floor, filling them and consolidating them into a solid mass, which the untrained eye cannot see? Surely it is worth bringing in the real industrial expert cleaners once in a while to get a thorough clean for your floors. Well, tile and grout cleaning is exactly what we care about and specialize in. We believe that there is always room for improvement. That is why we ensure every particle of your tiles is cleaned to the utmost degree with our top of the line cleaning products and staff members. 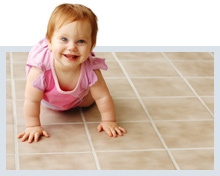 So call San Diego Carpet Cleaning at 858-437-9300 for a free estimate and soon enough you will be able to enjoy really clean tiles!